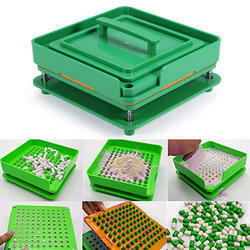 We are a leading Exporter of capsules hand filling tray size 0 and capsules hand filling tray size 00 from Mumbai, India. Capsules Hand Filling Tray is used to fill 100 capsules in 5 min time. We have to Capsule Hand filling Tray Size 00. You can fill 100 capsules with in 5 to 7 min.